Get Going. Get Done. Get Results. How you think is how you plan is how you execute. In most (not all) contexts, what’s the worst that can happen if a plan incurred marginally extra planning that resulted in marginal additional quality? What’s the affect on the outcome? One could argue that the extra degree of planning wasn’t worth the extra degree of quality…which would mean a minor reduction in the effort’s ROI. But another possibility is far more pernicious. 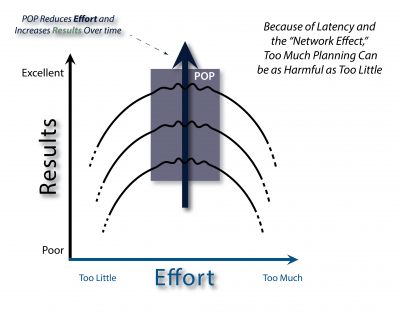 A hastily-constructed (as well as a too-too ponderous) bad plan today is not only not good tomorrow…it results in negative value: frequently in excess of 100% of the total planning plus execution investment. Why? Because the cost of a bad plan isn’t limited to squandering the planning investment. For you see, unlike the prior example, there is no limit to losses from a bad plan. For example, in the IT Sector—where (according to the Standish Group) the track-record of outright failed project is ~1/3rd—the losses extend to the entire investment…AND BEYOND! These kinds of losses negatively affect the entire organization (e.g., lost customers, opportunity costs, dwindling marketshare), as well as personally (e.g., loss of reputation). As you examine the two scenarios, consider the thinking that went into each. Organized? Hasty? Reactive? Purposeful? Based only on your assessment of the thinking that went into the two scenarios, what’s your prediction? How did execution fare? 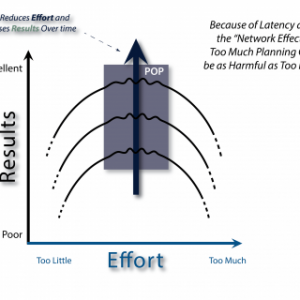 Could excellence in execution overcome a bad plan? Which scenario do you forecast came closer to completing on-schedule, on-budget and meeting expectations? Do you agree there is a causally significant relationship among thinking, planning and executing? Punchline: Scenario One describes a project that was cancelled after expending nearly USD$1.3 million and a year’s effort of ~eight professionals…yet produced nothing more than voluminous planning documents. Scenario Two—undertaken after the cancellation of Scenario One (i.e., both scenarios are for the same project)—was completed in less than 30 days and the entire effort (~USD$750k) was delivered in ~five months. Which would you rather experience? Whether you are a well-seasoned PMI PMP—or a Project Management newbie—gain, and use, a key insight into the fundamental basis of all estimates as you Get Going, Get Done and Get Results with the Plan On a Page. Get the POP-Book and learn how the Plan On a Page—the simplest, easiest-to-use planning approach—will help you successfully execute even the most complex projects and efforts. 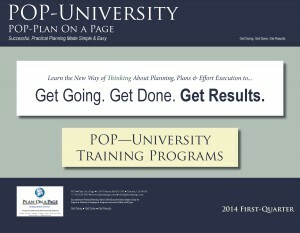 Take advantage of the POP-University’s Online, or On-Premises, Training Programs. Click on the image to download a complimentary POP-University brochure, then Get Going, Get Done, and Get Results. If you found value in this post, please “share” it on LinkedIn and Google+ by clicking the buttons below. If you didn’t like it…please let me know. In either case, thank you. Better Project Management with Plan On a Page © 2019. All Rights Reserved.